Campbell Soup and Third Point Management, the hedge fund owned by billionaire Dan Loeb, are reportedly nearing a deal that would shake up the company’s board of directors. Third Point will reportedly nominate two new directors and could have say on a third, as well as the new CEO, The Wall Street Journal reported Sunday. Third Point has accused the company’s board of putting the interests of insiders and wealthy heirs ahead of shareholders. Watch Campbell Soup trade live. 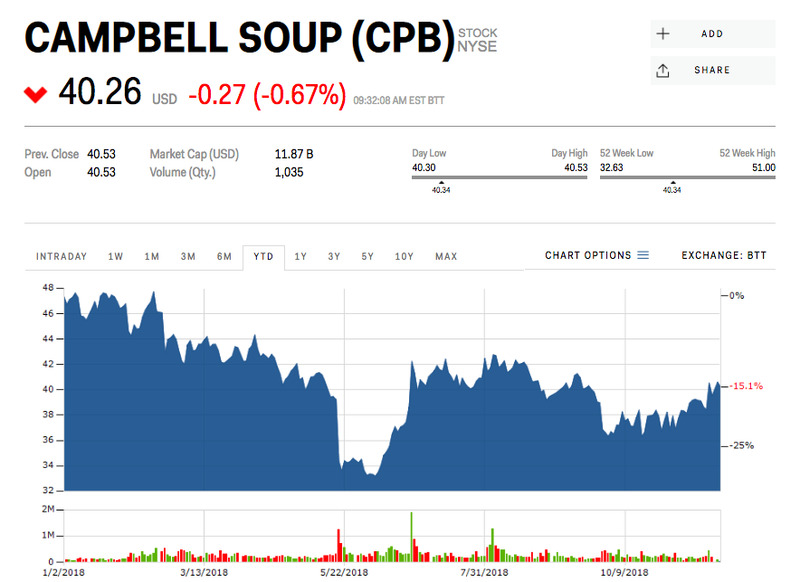 Campbell Soup and Third Point Mangement, the hedge fund owned by billionaire Dan Loeb, are reportedly nearing a deal that would shake up the company’s board of directors. Shares of the soup maker were little changed following the news. Loeb and Third Point are expected to nominate two new board members, Comscore President Sarah Hofstetter and former Blue Buffalo Chief Executive Kurt Schmidt, expanding the size of the board from 12 to 14, The Wall Street Journal reported late Sunday. The hedge fund could also have input on a third director and Campbell’s new CEO, the report said. Campbell’s shares had a rocky tenure under the leadership of the former CEO Denise Morrison, who retired in May. Morrison took leadership of the soup giant in August 2011, and over the next five years shares soared by more than 100%. But after peaking in July 2016, they had lost 40% of their value before Morrison stepped aside as the company’s soup business struggled through years of disappointing sales. But things appear to be turning around – at least a bit – since Morrison’s departure. Shares have rallied 18% since May, and in its first-quarter earnings report, out last week, the soup maker reported sales jumped 25% versus a year ago. Soup sales slumped 6% – a bit better than the 9% drop from a year ago. Additionllay, the company reaffirmed its fiscal-year 2019 guidance. Campbell Soup isn’t the only company Loeb has put pressure on this year. In July, he called for the food group Nestle to divide into three units, spin-off non-core businesses, and appoint an outsider with food and beverage expertise to its board. Previously, he has led turnarounds at Dow DuPont, Yahoo, and Sotheby’s. Campbell Soup shares were down 16% this year through Friday.